Project Linus Make A Blanket Day is a Huge Success! Nothing warms our hearts and souls quite like a handmade blanket! We were so delighted to join our friends at Project Linus over the past month to sew for their annual Make A Blanket Day! Last Saturday, volunteers joined forces to sew, tag and stitch poems onto over 530 blankets to be donated to children in local hospitals throughout the Triangle area. 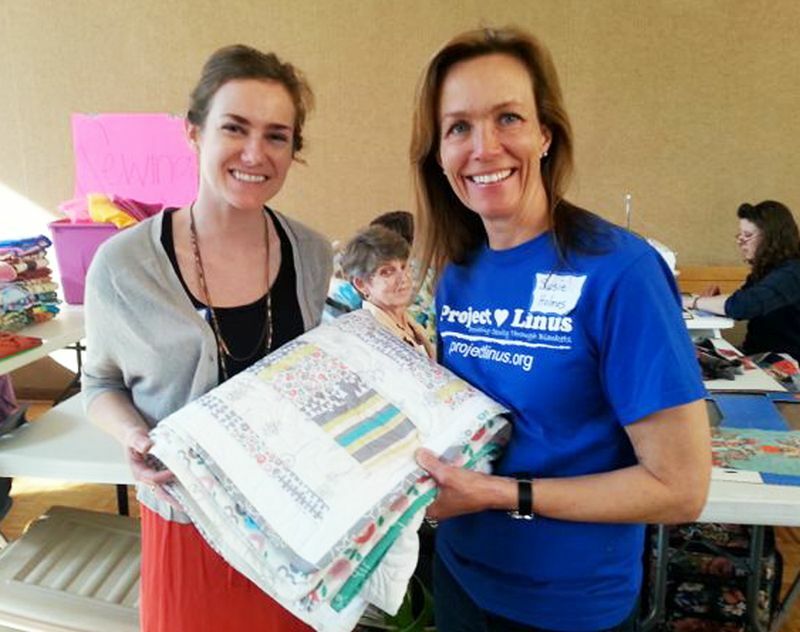 Area Project Linus Volunteers have donated over 33,000 blankets over the past 20 years. 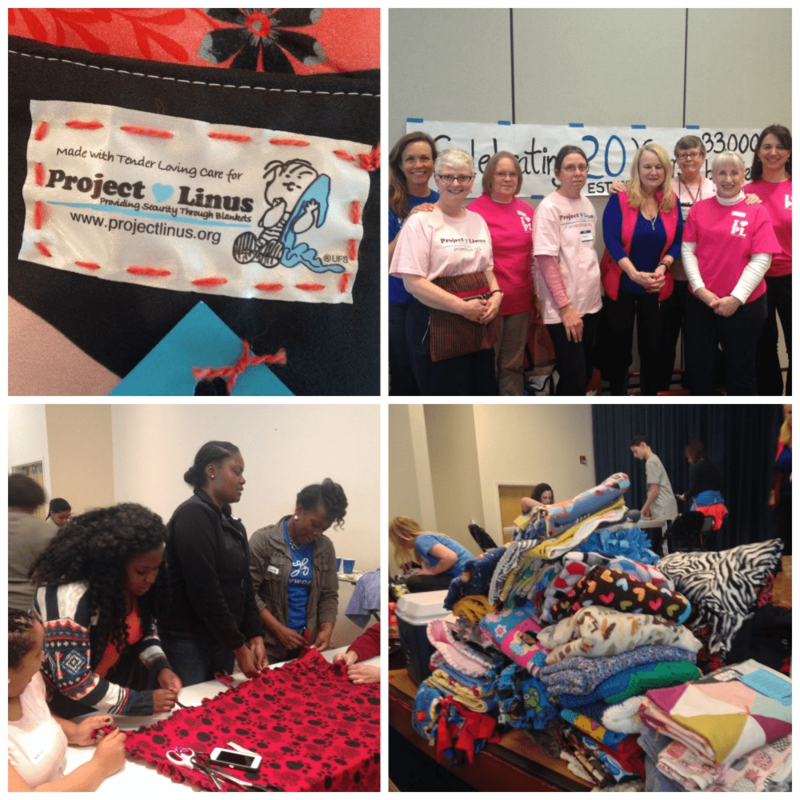 [Read more…] about Project Linus Make A Blanket Day is a Huge Success! It was an unusually cold and snowy week in North Carolina, but there was lots of warmth at the Project Linus Make a Blanket Day. Sweet little blankets by Spoonflower team member River featuring Teal Antlers by EFOlsen and Pink Charcoal Diamond Fall by Ivie Cloth Co. The mission of Project Linus is to give a sense of comfort and warmth to children who are seriously ill or traumatized by providing them with a “hug” from a handmade blanket. In just a few short hours, the team of blanketeers made 295 blankets that will go to children in our community. It was delightful to see volunteers from age 5 to 85 working together to sew, knit, and crochet so many beautiful blankets. There were groups of teenagers sitting on the floor to hand tie fleece blankets. More experienced quilters brought their sewing machines and talent to create quilts from the mountain of donated fabric. A tiny, young girl sat on her mother’s lap and carefully guided squares of fabric on the sewing machine to create quilt blocks. As blankets were completed, a blanketeer hand sewed a Project Linus label and attached a poem. Over 30,000 blankets have been donated since Susie Holmes established the Raleigh, NC chapter of Project Linus in 1996. The blankets are distributed through hospitals, shelters, and social services agencies. Spoonflower is proud to be a part of providing “hugs” to these very precious children. This past weekend, we were delighted to be a part of the annual Make A Blanket Day put on by our local chapter of Project Linus in Raleigh, NC. Project Linus is an organization devoted to comforting kids and teens facing serious illness and trauma with a gift of their own handmade security blanket. Since our local chapter was founded by Susie Holmes in 1996, area "blanketeers" have donated over 27,000 blankets to local agencies and hospitals. Their recent Make A Blanket Day was a huge success, and we were so excited to present our finished quilting bee blanket created by members of our Greenhouse community! Local Project Linus coordinator Susie Holmes accepts our Greenhouse blanket. Greenhouse Event: October’s Open Studio + a quilting bee! 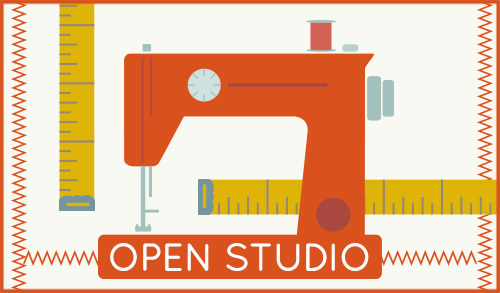 Registration opens today for October's Open Studio! 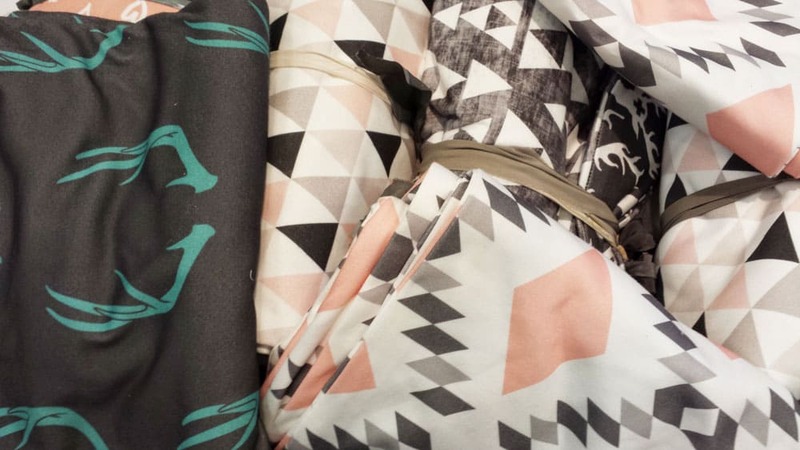 Join us in the Spoonflower Greenhouse on Tuesday, October 22, from 6-9pm to work on your sewing project of choice or start something new with expert advice and instruction on hand. We've had so much fun since we launched this event in August, and, I must say, it has been so inspirational to see what our community has in the works with craft projects that range from quilts to coffee cozies– last month, we actually saw the "cat's pajamas"! Clockwise from top: Anne's quilt, Rachel's comic book coffee cozy, and Lisa's "cat's pajama" bottoms! As we head into colder weather, we have quilts on the brain, and starting at this month's Open Studio, we're going to initiate a social quilting bee for the holidays! 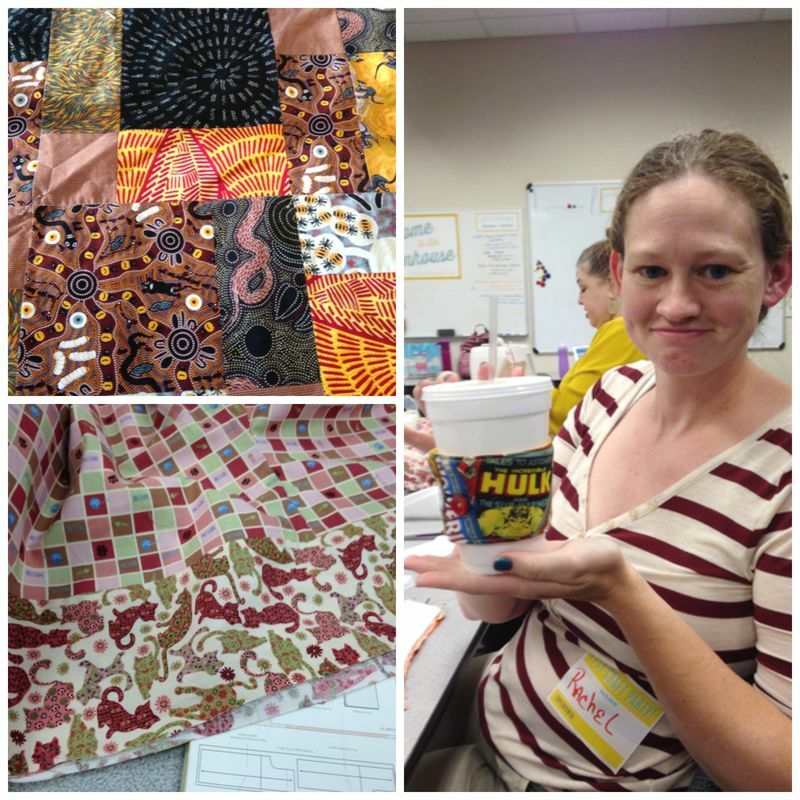 [Read more…] about Greenhouse Event: October’s Open Studio + a quilting bee!